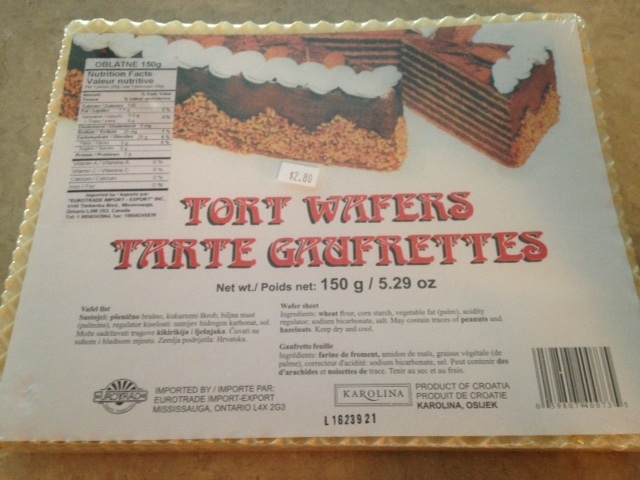 Oblande is a Serbian dessert consisting of layers of wafer and walnut filling. Thank you to Ankica for sharing her recipe with me. Here’s how what you will need and how to make it. 1. In a bowl combine the walnuts and petite beurre. Set aside until this mixture is needed. Walnuts and petite beurre mixture. 2. 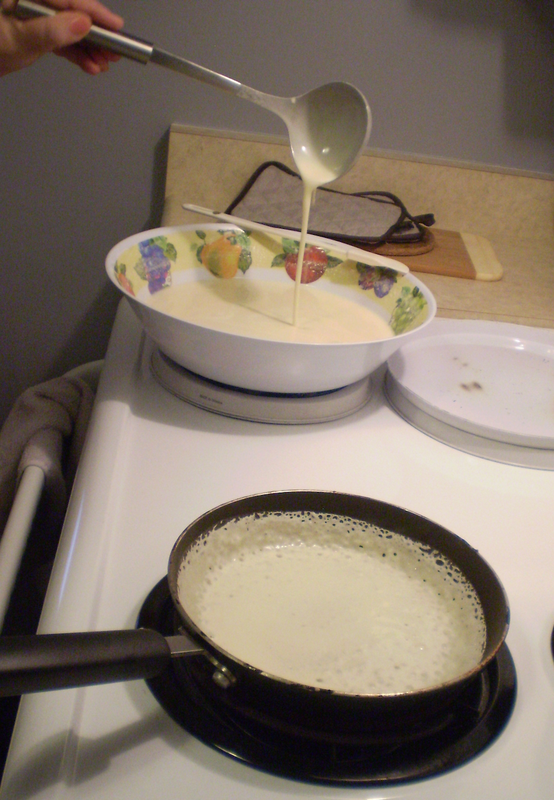 In a pot on high heat, melt the butter with the sugar, milk and vanilla extract. Bring to a boil, being careful to keep a close watch on this heating liquid mixture as it can burn very quickly. Stir constantly. 3. Once this mixture has reached a boil, remove from heat. Then add the walnut/petit beurre mixture from 1, as well as the eggs. Stir continuously for about 5 to 6 minutes. The mixture should thicken and have a porridge consistency. 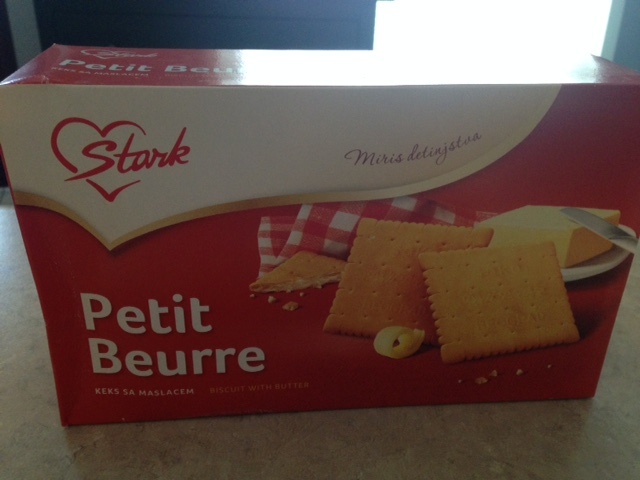 If it’s too watery add a bit more grounded petite beurre. If it’s too thick, add a bit more milk. 4. It’s now time to assemble your oblande. Line a baking sheet to contain any mess created from assembling. Place one waffer sheet on the baking sheet. If your waffer sheet has two different patterns on each side, put the side with “grooves” facing up so that the walnut filling holds in place better. Place a thin layer of filling on the wafer. Repeat until you finish with the last waffer sheet. Put the last layer of filling on the top waffer exposed like in the picture below. 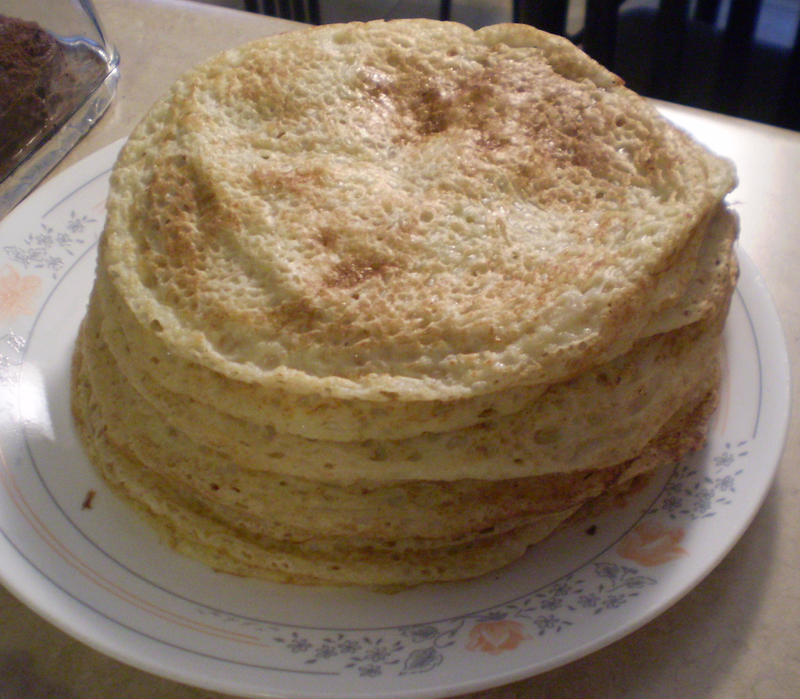 Layers of waffer and walnut filling. These waffer sheets have a smooth side and a “grooved” side. The groovy side will contain the walnut filling better. 5. 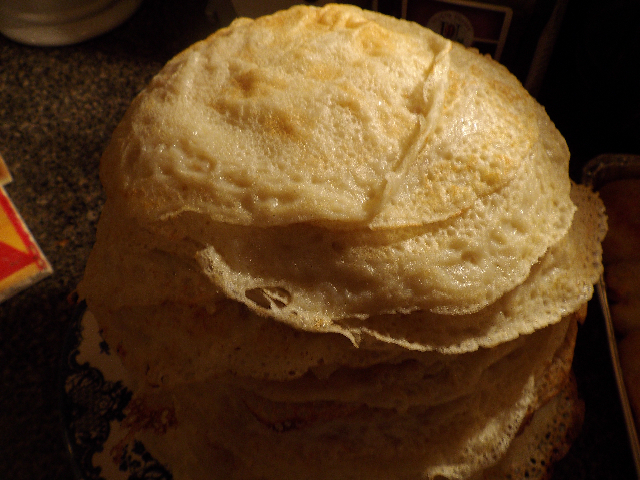 Cover the top layer with some parchment and then place some heavy items on top of it. This will help the oblande set. Keep the heavy items on top for about 6 hours. 6. Remove the heavy objects, and then refridgerate several hours before cutting. This will make the oblande much easier to cut. 1. In a large mixing bowl, combine butter, peanut butter, sugars, egg and vanilla. Mix well. 2. In a separate bowl, sieve together flour, baking powder, baking soda, cinnamon and salt. 3. Gradually add dry ingredients to wet ingredients. Combine thoroughly. 4. Form balls of dough approximately 1.5 inches in diameter. 5. Place on a lined baking sheet approximately 1 inch apart. 6. Gently flatten dough balls with a fork, then rotate fork 90º and genlty flatten one more time. This will make a criss cross pattern on each cookie. Cookies immediately before placing in the oven. 7. Bake in a preheated 375º oven for 11 to 12 minutes. 8. Let cool for a few minutes before eating. 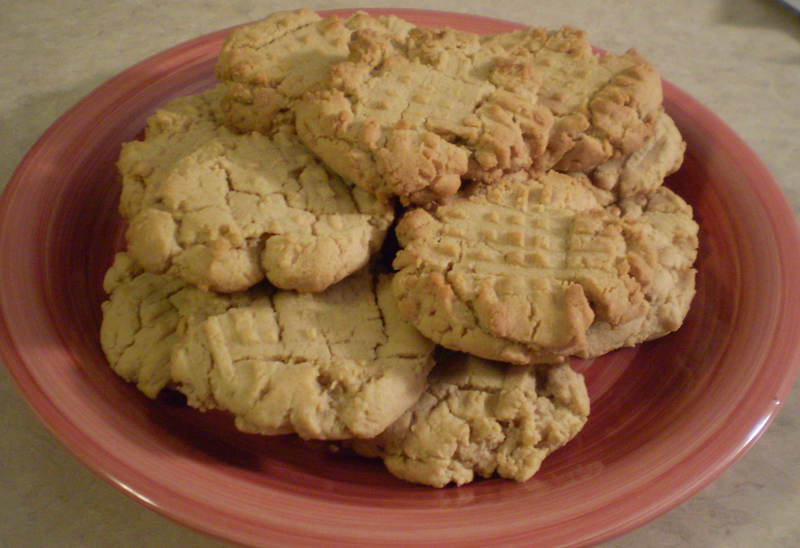 *The brown sugar makes moist soft cookies, so if you prefer more crunchy crisp peanut butter cookies, reduce the amount of brown sugar by replacing with an equal amount of white sugar. 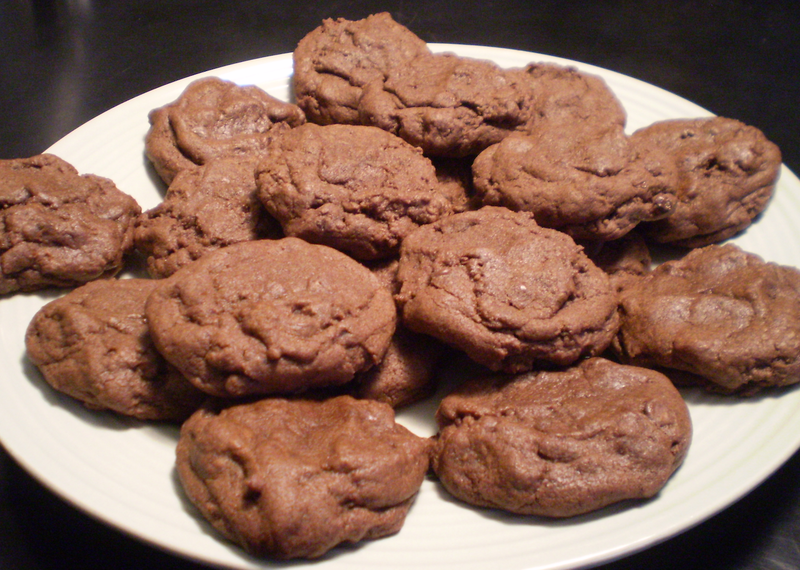 Cookies immediately after baking. Two thumbs up from the cookie mascot. 1. In a large mixing bowl, cream together butter, sugars and egg. Add in vanilla. 2. In another bowl sift flour, baking powder, baking soda, salt and cinnamon. 3. Gradually add dry ingredients to wet ingredients. Combine well. 5. Form about one inch in diameter dough balls. 6. 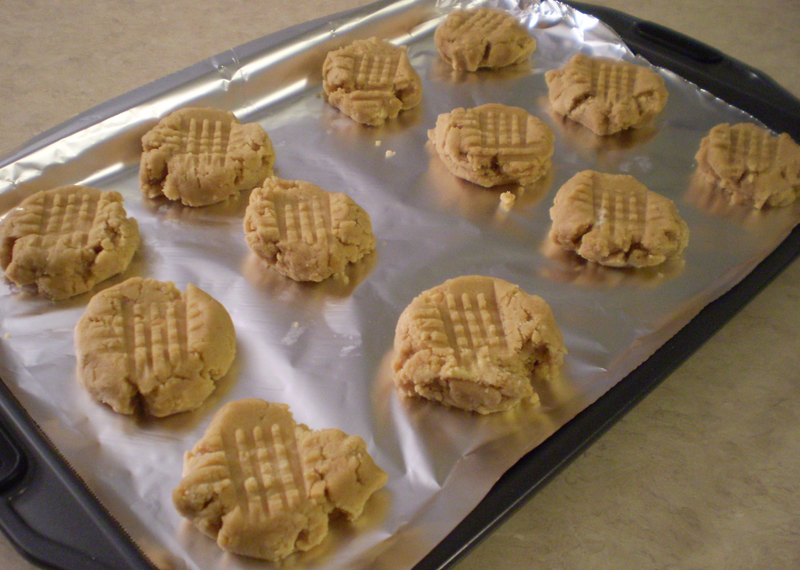 Place dough on lined baking sheet and leave about two inches of space per cookie. Gently flatten each ball with the palm of your hand. 7. Bake for 350º for 9 to 11 minutes. This recipe makes about 18 cookies. It was inspired by the following cookie recipe. 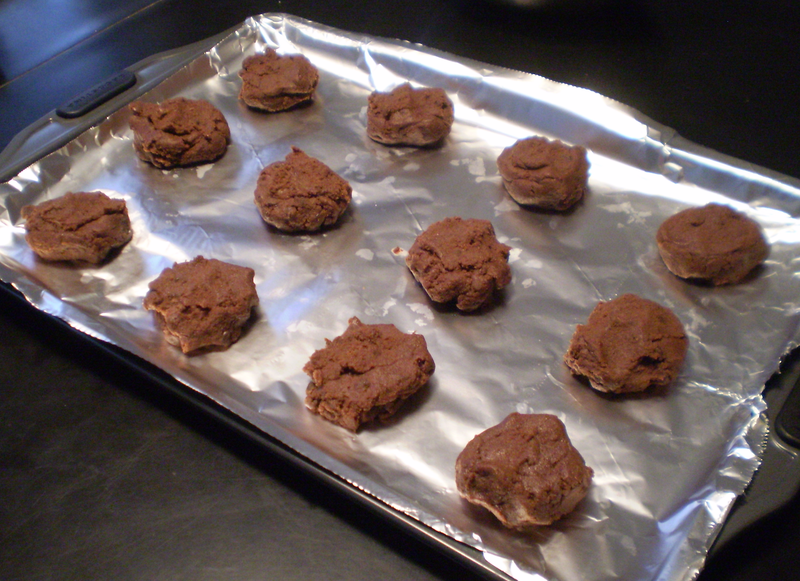 Cookies immediately before being placed in the oven. 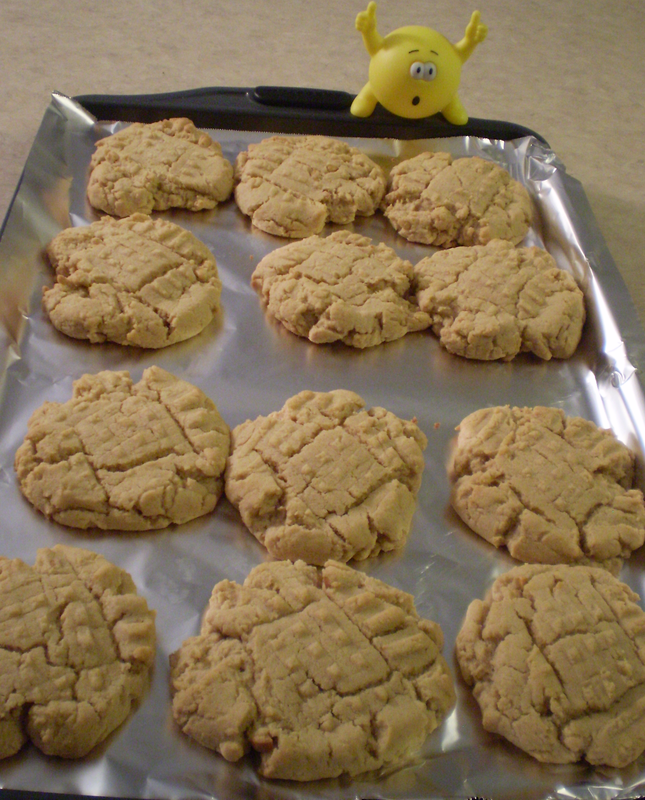 Cookies immediately after baking. 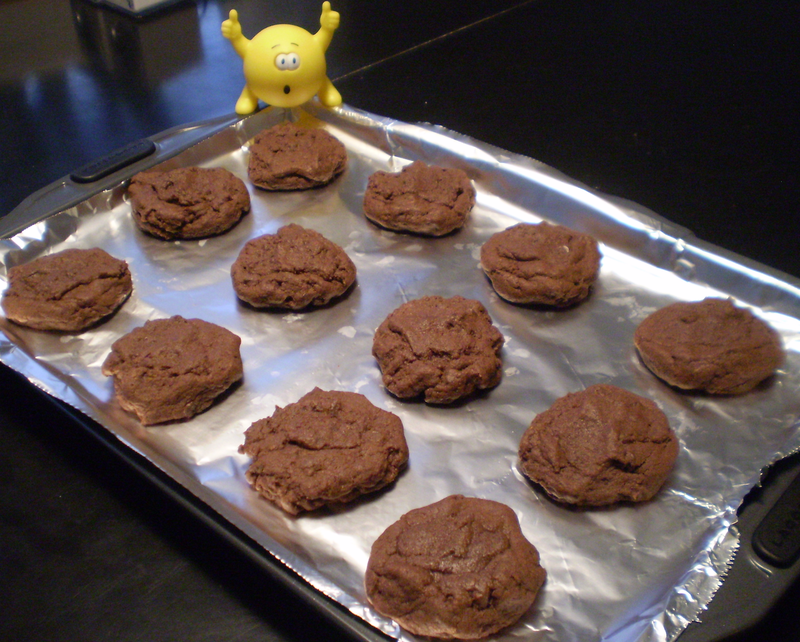 Cookies mascot says two thumbs up. Double chocolate chip banana cake with chocolate icing and garnished with fresh raspberries, icing sugar and cocoa powder. 1. In a large mixing bowl, combine banana, sugar, egg and oil. 2. In another bowl, sift together the cocoa powder, baking soda, baking powder, salt and flour. 3. Gradually add dry ingredients to wet ingredients. Once mixed, add in chocolate chips. Combine thoroughly. 4. 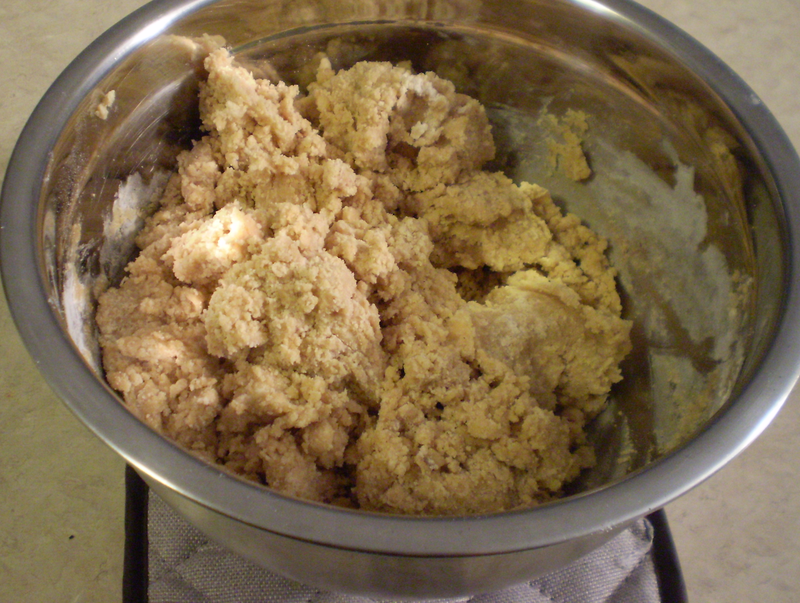 Grease a baking dish (8 by 9.5 inch) with oil and then coat with a light layer of flour. 5. Pour cake mixture in and bake for 350º for 20 to 25 minutes or until the cake separates from the sides of the baking dish. 6. Let cool and decorate as you choose. 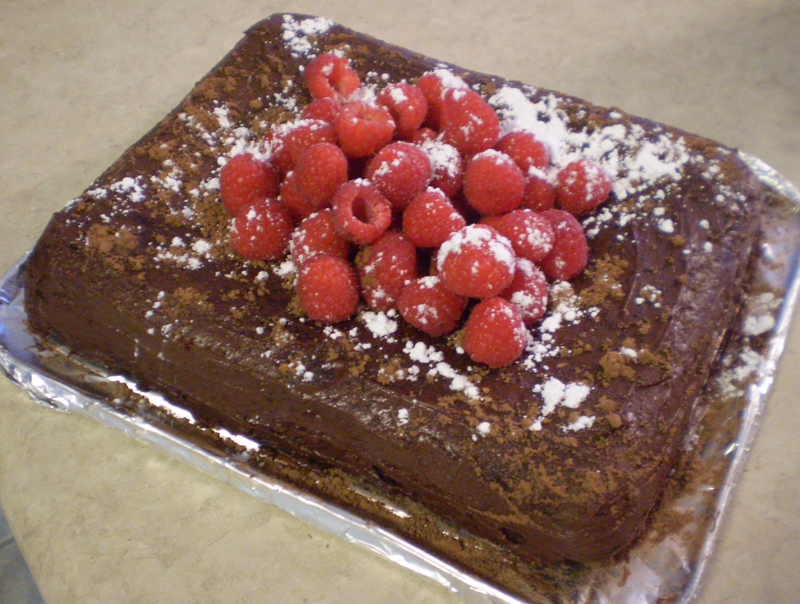 Our cake was decorated with chocolate icing, a dusting of cocoa powder and icing sugar, and garnished with fresh raspberries. 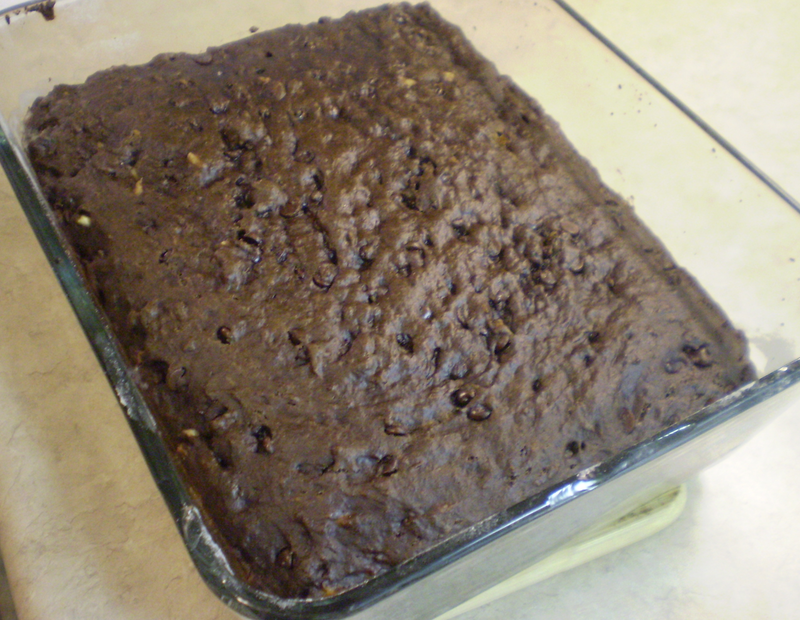 Undecorated cake fresh from the oven. The above cake creation was inspired by the following double chocolate banana muffin recipe. Thank you to Lillian for making the cake. 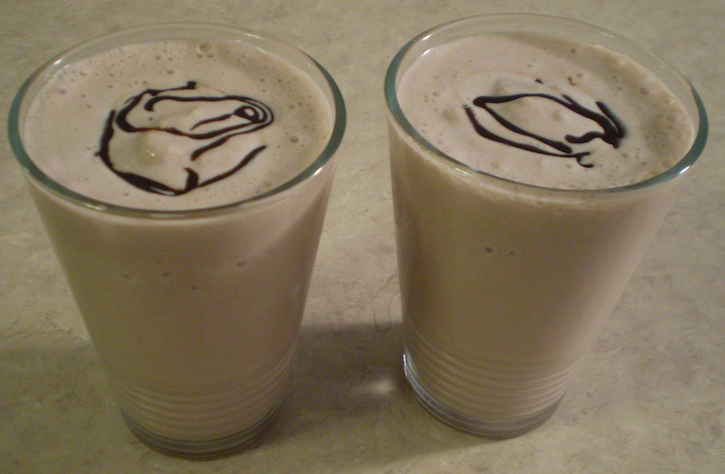 Stay tuned next week for another “double” recipe!